Based on the best-selling WireMac, the Akiles WireMac-Duo has both die sets installed in one single unit. This machine punches and binds both 3:1 and 2:1 pitch wire with no need to change dies. This new wire binding system is all you need to punch and bind Double-O wire from 2 sheets to 200. The Duo has a 15 sheet and a 14” width punching capacity with open sides for wide documents. In addition, all of the dies can be independently disengaged to allow the punching of any sized document while preventing partial side-end perforation. The depth margin controls provides the correct punching margin depth needed for all wire sizes and maximizes the document’s tear resistance. The WireMac- Duo has side margin controls which provides a well-centered punch and a master selector which is used to determine the correct wire diameter, closing position, depth margin, and wire punch to get the perfect punch every time. The WireMac-Duo measures 2.22 cubic feet, and only weighs 53 pounds so it can fit on almost any working surface. The WireMac- Duo with the 3:1 (square punching holes) pitch has 40 disengageable dies and the 2:1 (rectangular punching holes) pitch has 27 disengageable dies. The WireMac-Duo Binding Machine is a great choice for medium-duty punching and binding needs where a wide range of book thicknesses are required. If you have any questions or are interested in purchasing the WireMac Duo, visit us at SpiralBinding.com. 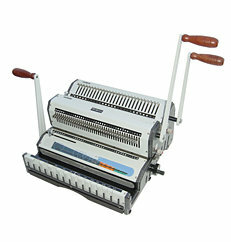 We have great pricing on a full line of Wire Punching and Binding Machines. Call us at 1-800-631-3572 for more information.